1. Nah, that’s not a misleading title! An op-ed in the Times yesterday had the alarming header, “Trump’s New Target: Citizenship.” In fact, the piece was about the movement to end automatic U.S. citizenship for those born here of illegal immigrant parents, and the Trump administration policy of seeking to “denaturalize” foreign-born citizens who achieved citizenship status by withholding disclosure of previous crimes. As with many aspects of the bizarre national immigration debate, support for continuing the first principle is hard to justify. It is a remnant of a time when there were no restrictions on U.S. immigration, so the birthright rule made sense. Now, when illegal immigration is a serious concern, the same principle creates a perverse incentive to break the law, and makes immigration law enforcement complicated and difficult. The second issue is more debatable. The New York Times has another “good immigrant” story, this time one that seeks sympathy for Norma Borgoño, a Peruvian immigrant who took the oath of citizenship in 2007. The Justice Department has moved to revoke Borgoño’s citizenship, claiming that she committed fraud when she applied for it. She apparentlyfailed to disclose that she had taken part in a serious crime several years before her application, then four years later, in 2011, pleaded guilty when she was charged for helping her employer defraud the Export-Import Bank of the United States of $24 million. Writes the Times, “Since President Trump took office, the number of denaturalization cases has been growing, part of a campaign of aggressive immigration enforcement that now promises to include even the most protected class of legal immigrants: naturalized citizens.” That is a deceitful sentence, full of spin, as is the entire story. For “aggressive immigration enforcement” read “enforcement.” The U.S. has every right, and in fact a duty, to assess what kind of people it wants to allow to become citizens, and criminals need not apply—after all, we have enough of them already. The Times finds it significant that Borgoño hasn’t been charged with her crime when she applied for citizenship, but she was still a criminal, and the crime wasn’t stealing a loaf of bread, either. It also spins that her aiding a massive theft was “to no benefit of her own.” Oh! Then that’s OK, then! Presumably there was the benefit of keeping her job with her boss the felon, at very least. The Trump administration isn’t “targeting citizenship,” but rather naturalized citizenship that was improperly granted, based on false representations. People have to learn to stop applauding unethical conduct. 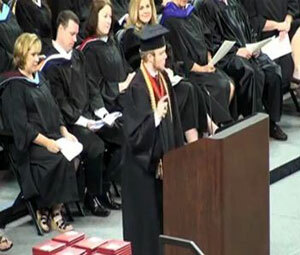 Roy Costner IV, honored with the opportunity to give the valedictory speech to fellow graduates of Liberty High School in Pickens County, South Carolina, decided to defy the School District’s decision to exclude prayers at graduation ceremonies. He began his prepared and approved graduation speech, then tore it up dramatically and segued into the Lord’s Prayer, to the apparent delight of many in attendance.